Export all mailbox items : emails, calendars, attachments, tasks, etc. 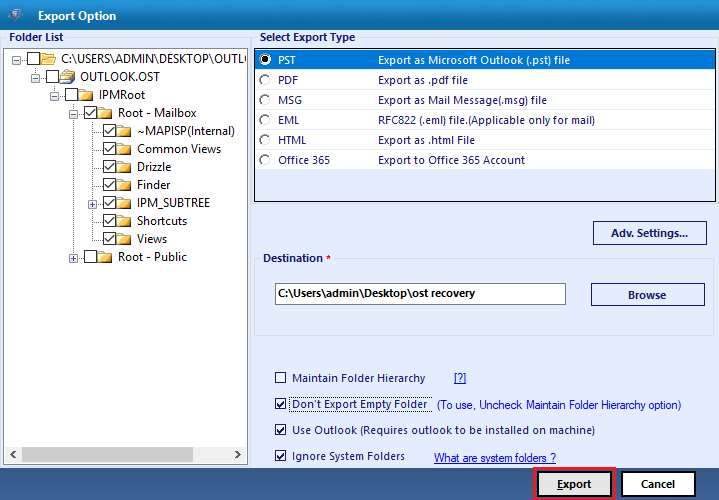 Convert Outlook.bak to PST for MS Outlook 2019, 2016, 2013 etc. 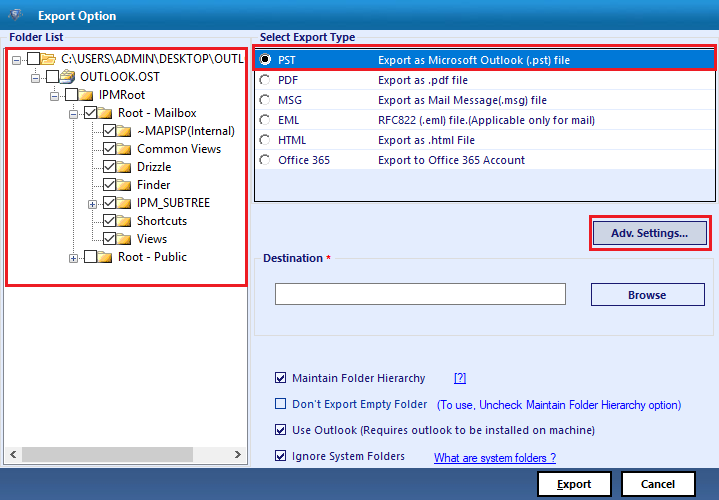 Support OST file conversion for Outlook 2019, 2016, 2013, 2010, 2007 etc. The OST to PST converter software enables users to transfer all mailbox items from offline folders to Outlook personal storage format. It completely holds metadata properties of associated emails (or any other item) and also exports messages with their respective attachments, if any. Once the OST file is thoroughly scanned by the OST to PST file exporter, it will instantly load entire extracted data on its preview window. The mailbox data folders will be arranged in a systematic manner, which includes all folders displayed on screen in form of tree structure. Interactive and user-friendly layout of the product makes it effortless workaround to move OST file to PST. The application renders a step-by-step interface, which does not requires high knowledge of Outlook to operate it. It permits users to export files in a simplified way within minimum time duration. If one is not at all interested in exporting complete data items of offline folder file then, Microsoft OST to PST Converter provides an ultimate feature to perform the selective migration. Users just need to check those emails or folders, which they want to copy in .pst file format. This OST to PST migration tool employs updated technical algorithms to support OST files, which are inaccessible, corrupted, or damaged. Moreover, the product also extracts hard deleted OST items and then, equips option to save them in PST file format. 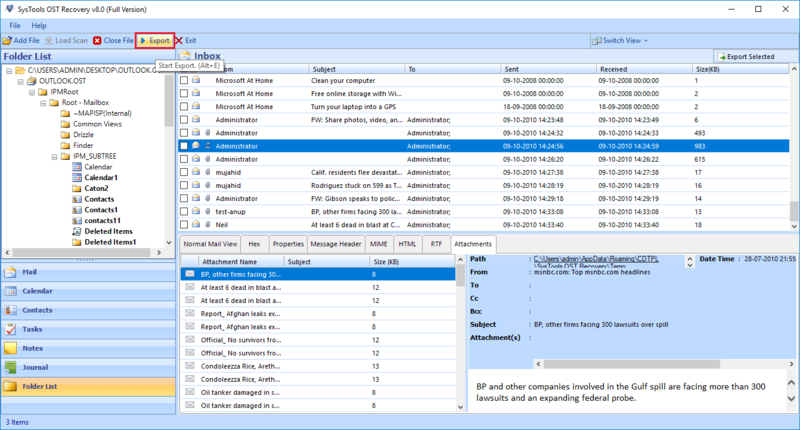 The Outlook .ost file to .pst migrator permits users to store the entire procedure in a CSV file format. This file can be saved at user-defined location, which might prove itself useful for future reference purpose. Apart from this, CSV file of OST to PST migration comprises of entire information about the conversion process. The OST to PST converter software is provides a stunning search feature. Which empowers users to export OST file into PST format even without knowing the location of OST file. It will enable you to Search the OST file in two mode i.e. either search in all drive or search in specific drive. 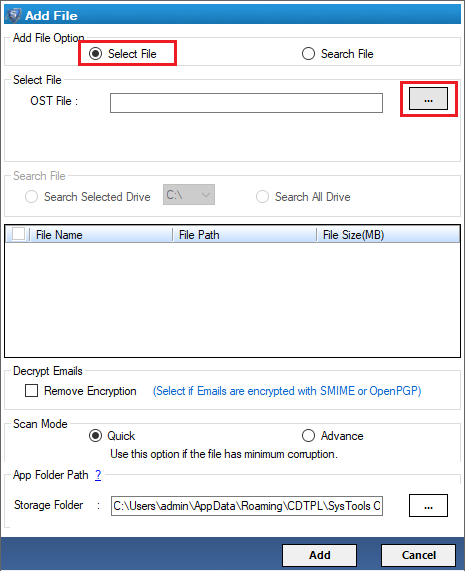 The software is capable enough to remove the S/MIME and OpenPNG encryption from OST file. After that export OST to PST format. Due to this feature user can easily convert healthy as well as encrypted .ost files without any restriction. How will I able to transfer emails from OST File to PST, selectively with help of your software? While previewing OST emails, check the checkbox of those messages that are to be moved in PST. Now, perform right-click on those emails and click on Export button. Select PST option and then click on Browse button where you want to save PST emails. 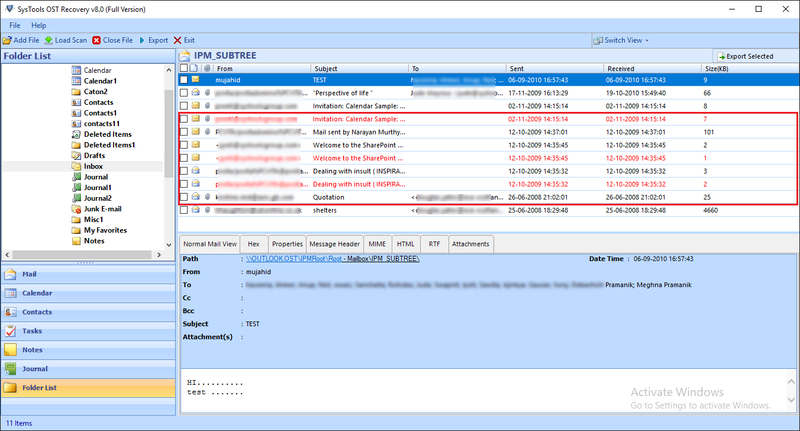 Finally, click on Export to originate the process of selectively moving OST emails to PST. Is it possible to convert mailboxes of an inaccessible OST file into PST file format? If yes then, how? Yes, of course, it possible to convert severely corrupt OST file too. You just need to enable Advance Scan option, before clicking on Add file button to scan source file. What are the limitations of free OST File to PST converter software? The Microsoft to PST file migration tool is available for free to test the working and efficiency of the software, before purchasing it. This trial version enable users to export only 25 items per folder from OST file to PST. 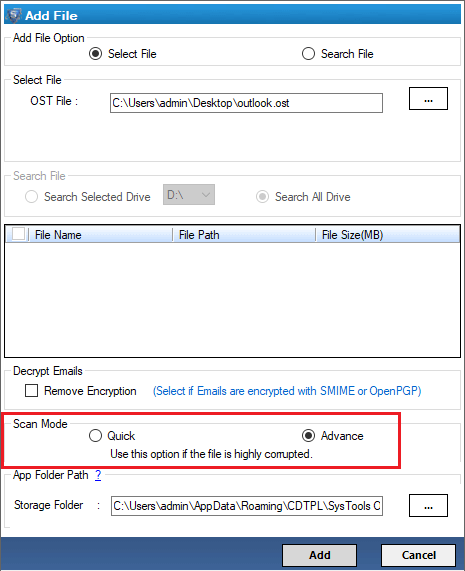 Is there any size limitation for file migration of OST file into Outlook PST format? No, there is no OST file size limitation to perform conversion with help of our software. The tool safely exports any size of .ost file into .pst with an ease. I Have OST File of Outlook 2010 and After Conversion. Can I Open PST File in Outlook 2016? Yes, The ost converter software is capable to export ost file from any version of outlook like 2007, 2010, 2013, 2016, 2019 and after converting it into PST user can open pst in any version of Microsoft Outlook. How to Download OST to PST Converter Crack Version for Free? Downloading crack version of OST file to PST converter is not good move. Because the free serial key utility may contain the hidden virus. Which make the situation worse. So avoid downloading crack version or free serial key. Also, suggest your friends for not to go for OST to PST Converter download crack full version with free serial key. Download .EXE setup file of our tool for installation. After the successful installation, launch software either by clicking on its desktop icon or by going to Start then, search for OST to PST file converter product, and click on it. Click on Add button to initiate procedure of selecting source OST file, whose data items are to be saved in PST file format. Click on ... button to initiate procedure of selecting source OST file, whose data items are to be saved in PST file format. At last, click on Browse button to locate the location where you want to save resultant PST file and then, hit on Export button to initiate procedure of OST File to PST File migration. 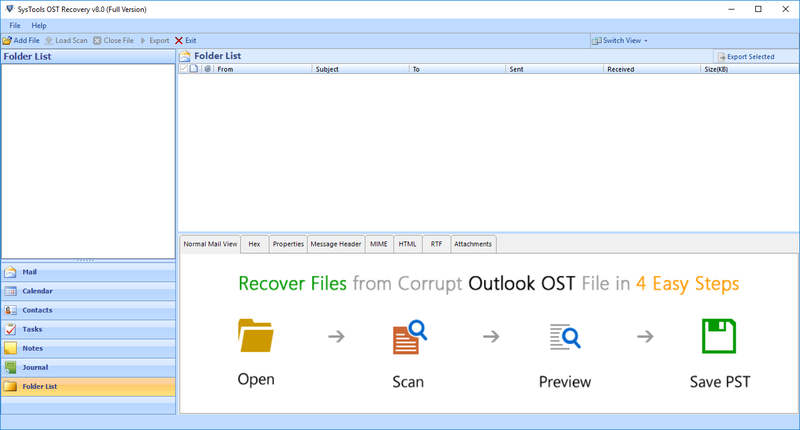 "I am feeling glad while writing a review on this Outlook OST File to PST converter. Earlier, it was really a bad experience when I tried to export OST file to PST with few manual tricks. One of my friend recommended me to use this application, which is really an outstanding tool to convert Outlook OST Emails to PST file format. A big thanks to the solution providers who gave a simplest solution on how to move OST file to PST." 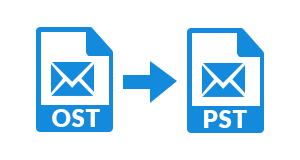 "Thanks for a cost-effective approach to copy OST file to PST, which is dedicatedly offered by this OST Mailbox to PST file migration tool. Due to the server downtime, I was having fear that my data might get lost. Therefore, I decided to take backup of OST into PST file format and utilized this software. The best thing was that within just few minutes and with few clicks I was able to take backup of mailbox items in a hassle-free way." "I was in need to convert OST to PST file format. For this I was searching free solutions and I searched OST to PST converter free download full version crack on internet. And download three utilities but non of them were free. Then my friend suggested me, never trust on OST to PST Converter crack software. Always use only digitally signed software and download from trusted website only. Then I tried this SoftwarePro OST to PST Converter and easily exported complete data."